I’ve got a great little recipe for you today, my friends. Isn’t that what you came for? And only takes a little bit of time. 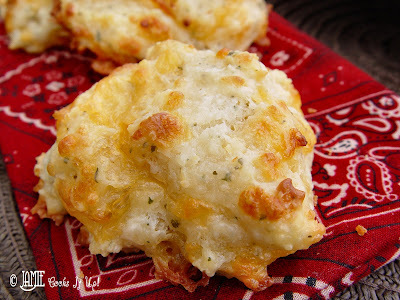 If you’ve eaten at Red Lobster you know the best thing swimming around that joint are the Cheese and Garlic Biscuits. The live Lobsters they having swimming in the front lobby may also be very tasty. Too busy with the biscuits. Also not in love with making eye contact with my dinner. 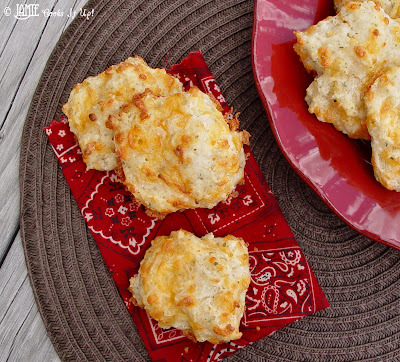 please don’t hold it against these beautiful biscuits. melt in your mouth delicious. Hope you make them today! 1. Get your self a large bowl. Toss the flour, salt, baking powder, pinch of garlic and parsley together to mix. 2. Cut your cold butter into chunks. 3. Add the butter chunks to the dry ingredients. Using a pastry blender cut the butter into the mixture. Keep mixing until it looks like coarse crumbs. Should only take a couple of minutes. 4. Make a well in the bowl. Pour your milk right on into that well. Using a wooden spoon and mix the ingredients together. Don’t over mix here. You should stop mixing just before everything is incorporated. 5. Toss your shredded cheddar into the bowl and stir just until incorporated. Yes that’s me in the spoons reflection, holding the camera, wearing a big striped apron and no makeup. I don’t get too dressed up for biscuits. Just sayin. 6. Spoon the dough onto a large cookie sheet that has been sprayed with cooking spray. 7. Bake at 450 degrees for 10 minutes, or until golden and crispy along the tops and bottoms. 8. To your 3 T melted butter add 1/8 t of garlic. 9. Brush the hot biscuits with the garlic butter and serve. They are best served warm from the oven. If my daughter could have physical contact with you, she would hug you, kiss you, and shake your hand. She loves these biscuits. I may have to surprise her. My goodness, what lolvey photos! You have definitely put me “in the pink”!I am going to scroll down and catch-up on a few of your recent post that I may have missed while I was away. Your post always invite me to want to see more and more. Always beautiful! Thank you! WOW! I have wanted to make these biscuits at my home in Brazil for the longest time!! thanks for this!! Red lobster biscuits here i come!! My mouth is watering as I read this post – may have to make them for dinner tonight! I've always used bisquick and they always lacked something. Now I have new version to try. Thanks! Bless you for bringing this to my attention. The measurement originally given for the flour was off. You need 1 3/4 C instead of 1 1/3 C. So sorry for your wasted time and ingredients! Hope you give them another try! Thanks again for letting me know of the issue. Have a great night. Phew! Thank you for the correction. We actually still ate all of the biscuits. They were very yummy! We called them “flatbread” and felt very swanky! LOL! Keep up the great work! Your photos are amazing..and yeah for Red Lobster's biscuits. I could make a meal out of those biscuits! Yours look just like them..a must try. Baking powder or baking soda? On the printable, the ingredient list has powder, but the body of the recipe says soda. I tried them this weekend using baking powder, and they didn't rise at all…the taste was okay but the texture was way off. Which leads me to assume it's supposed to be baking soda but wanted to check before I try them again! So sorry, but there are two errors in the recipe you printed off. The corrections have been made now if you would like to print it off a second time and give it another try. You need baking powder, however the original flour measurement was off. You need 1 3/4 cup instead of 1 1/3 C. Sorry for your wasted time and ingredients! Hope you try them again and they turn out well. found this recipe on Pinterest. Just wanted to let you know that every time I make these people absolutely love them (as do I)! Easy and yummy! Great to whip up for a quick side. .. I think they would also be really good with a spicy ranch dressing. 🙂 Thanks again Jamie~! I'm sure I'll be on your blog often! Cant wait to make these with the crispy chicken! I haven't ever tried making the batter ahead of time. My thoughts are it might not work super well, because of the baking powder? But, I could be wrong. 🙂 I'd love to know if you try and how things go. Good luck! Hmmm I mayhave to try these and flash freeze a biscuit or 2 to see how they do .. would be great to make a batch and have them ready in the freezer to throw in the oven as my husband tends to bring some of the single soldiers home for dinner. Spaghetti or a Alfredo dish would be super yummy and a treat for them. I'm new to this, what does the t behind the ingredients mean? The small t stands for teaspoon, the upper case T stands for Tablespoon. Sorry, but even with the changes you made I found these to be flat, way too cheesy, and not nearly enough garlic to compre them to Red Lobster’s. I’ll keep looking for a copycat recipe. However, my kiddos did like them. My husband and I, not so much. Might be a recipe I can tweak enough to make it work. Thanks, though. I’ve tried a few Red Lobster copy cats & so far this is my favorite! They were a little flat, but the flavor/texture was wonderful. I’ll add a little more garlic next time…I was too worried about over doing it first time around;) Thanks for the recipe! First off, I have tried several of your recipes on the site and love them. As for this recipe, people seem to be saying they are a little flat. My rule in baking is that one should use baking soda when using milk and baking powder when using an acid like buttermilk. Think pancakes! I’ll give them a try both ways and let you know how it goes. Now that I think of it, maybe it would just need a touch more baking POWDER?